When Gionee's spin-off online mobile brand IUNI -- taken from "I am unique" -- launched back in November, it vowed to go right after Xiaomi with a similar sales strategy, but it's also differentiating itself by delivering "stunning" hardware design and "elegant" UI at the same time. Earlier today, the Chinese company finally showed off what it's been working on: the U2. 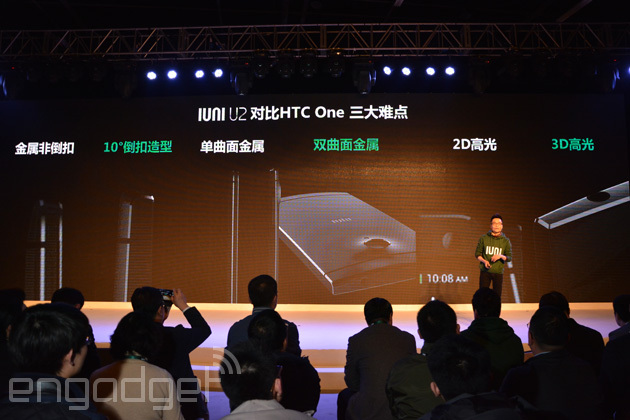 This 2.2GHz Snapdragon 800 device is positioned as the best single-hand metallic phone, featuring a 4.7-inch 1080p LTPS display -- similar to that of last year's HTC One -- tucked within a 65mm-wide aluminum body, which is narrower than the Huawei Ascend P6 and even the Moto X. Oh, and it's cheap, too: the 32GB version with 3GB of RAM is just CN¥1,999 (about $320) unsubsidized, whereas the 16GB version with 2GB RAM is just CN¥1,799 (about $290). Even though the U2 is a budget phone, a lot of work has been put into its design. The "double curve" design on the back reminds us of the palm-friendly Moto X, but appearance-wise, it's very much like a distant cousin of the HTC One with its similar zero-gap aluminum construction. However, IUNI pointed out that due to the 10-degree folds at the top and bottom, along with the shinier "3D polish" on the chamfer, the yield is just 48 percent from the 90-minute process at BYD's production lines. IUNI admitted that this costly process is rather insane for a budget brand, but this is where they see an opportunity to fight other Chinese online brands -- most of which sell plastic devices. You'll also be surprised by the cameras that come with the phone. On the back you get the same efficient 1.34µm, 16-megapixel sensor as Gionee's Elife E7, and it's even more interesting on the front: it's the same f/2.0 UltraPixel (4-megapixel, 2µm) camera as the HTC One's. The drawback here is that due to the bulkiness of the f/2.2 main camera, there's a bulge on the otherwise lovely back of the phone. On the software side, the IUNI OS claims to be the cleanest Android ROM you can get (at least in China), as it won't come with any pre-loaded third-party apps that tend to help generate revenue for manufacturers. The OS itself is also designed in a way to minimize the number of swipes and taps for most common actions, but we'll only know how effective this is once we have spent some time using it. Overall, it's pretty exciting to see a new player injecting fresh energy to the Chinese budget market. While most vendors are offering cheap product by cutting corners, IUNI is really trying to offer a decent phone that makes sense to users, while still able to sell it in the same price range. The U2 has the most efficient 16-megapixel camera, the fastest front-facing camera and it is great for single-hand usage. Sure, it only has HSPA+ instead of LTE, and the battery's just 2,200mAh, but for just $320 unsubsidized, we're not complaining at all. If you live in China, you can already head over to IUNI's website to leave a deposit for the 32GB version of the U2. Sadly, there's no word on global availability, but we'll keep an eye out for further announcements. The ISP will pay $12 million in settlement. They’re planning a town hall to share stories and strategize with other employees.